It’s time to save the world… with pizza? If you thought that the isekai genre couldn’t get even more ridiculous with a super long title, then you definitely underestimate the power of Japan. 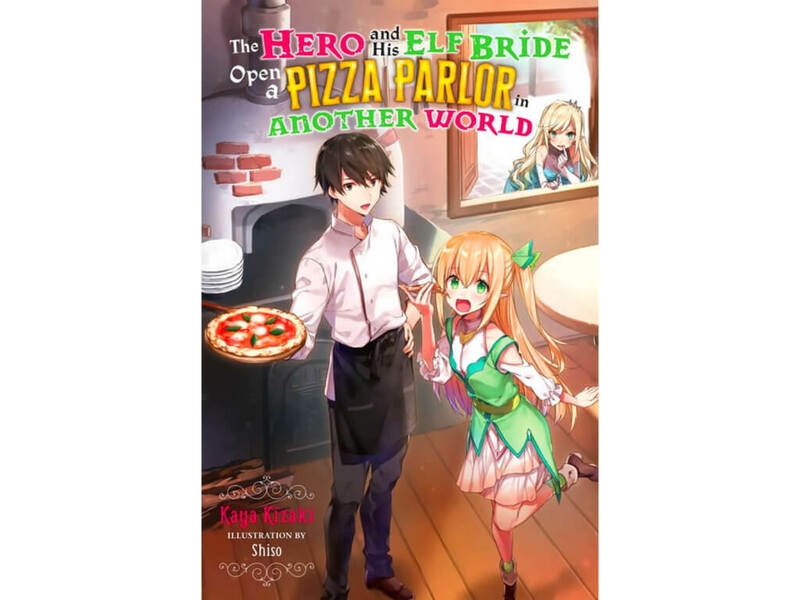 There were already interesting premises, such as getting reincarnated as a vending machine and a spider, but I think The Hero and His Elf Bride Open a Pizza Parlor in Another World takes it to a whole new level of odd. Who’s in the mood for some pizza now? The interesting thing about this series is that it consists of just a single volume. Unfortunately, there isn’t much substance beyond that. Taking a look at the table of contents, I was surprised to see that the volume is quite different than normal light novels. It’s intentionally written like a series of short stories, with the chapters being very quick reads. The author, Kaya Kizaki, definitely achieved his goal of writing a short and lighthearted series. It begins with our main character, Kaito, starving and pondering about what to get for lunch until he settles on pizza after seeing a popular chain’s logo. He is then struck by the very delivery moped he was observing. Oh, how tragic it must be to be killed by pizza. He is then sent to a very impatient goddess who gives him three reincarnation choices. Kaito’s indecisiveness between being a swordsman and a magician is ultimately his downfall and he doesn’t get a choice, with the comedy of this opening sequence reminding me a lot of KonoSuba. Instead, he is sent to an elf kingdom as the “High-Calorie Hero” and, after finding out at a banquet that they only eat tasteless vegetables, decides to save them with the power of pizza! He’s hosted by Edmond, the leader of the village, and, with the help of Edmond’s daughter Lilia, begins to set up his pizza parlor and hone his chef skills. The rest of the chapters focus either on a specific character that goes crazy over pizza or Kaito demonstrating his skills/furthering his pizza parlor business, culminating in the final chapter with the one “heroic” moment of the series. As for the pizza making, which is arguably the most important element in this story, I thought it was described in fairly good detail, having a lot of the techniques and theory that are often seen in online food videos. If you want to see how to make pizza at home, I recommend taking a look at Binging with Babish’s Pizza Basics video. It adds a visual element to what is described in the story, which I think is important for any reader wanting to make their own pizza. What I took issue with the most were the mechanics by which he made pizza. Kaito has magical items that give him endless ingredients, but the knowledge of how to make pizza is sent directly into his brain. I would have preferred if he was given cookbooks to learn, adding an element of struggle to the story, but the length of the book and genre most likely requires some level of convenience to exist. Kaito is the main character of this story and probably the only voice of reason that exists among the prominent characters, since everyone else is pretty one-note. Lilia is the main heroine and apparently Kaito’s bride, even though they aren’t married during the series. Her childishness and voracious appetite result in Kaito speaking to her the same way he did to his dog when she starts uncontrollably eating. Then there is Hans, the only well-fed citizen in a nation of starving vegetarian elves due to his severe honey addiction. Their traits are on a level of annoying and ridiculous that seems like it has to be intentional, almost to the point of parody. Find someone who looks at you the way Lilia looks at pizza! The art is probably one of the better points in this series. 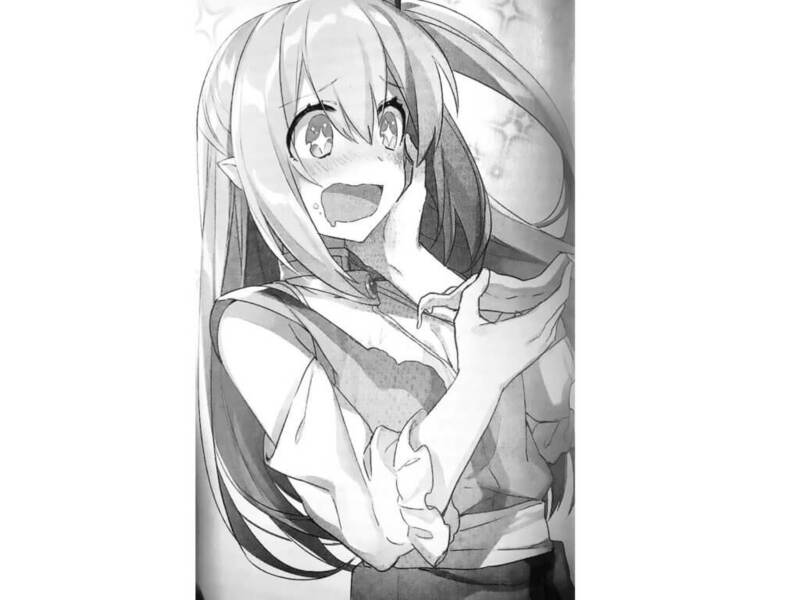 While I think the designs are pretty typical light novel illustrations for humans & elves, they are done well and showcase the characters, especially through their cute facial expressions. While I did criticize the story a lot, the author states in the afterword that it was his intention to write a series of short stories where each chapter is contained, but offers “a greater flow to the book and everything wraps up nicely in the end.” In that regard, I think he wrote to his intended objective and did the food elements of the story quite well, because I really wanted pizza during and after reading this book. My criticisms come from the hidden potential that I saw in the story as I was reading. The author could’ve thrown caution to the wind, ignored some pacing, gotten rid of the annoying character traits, and taken pizza to whole new world-saving levels all in one volume! On the other hand, the author could have also crafted a slower story that played to the elements of fixing the food culture of the elf kingdom, which has been hinted to be quite poor, with hungry and dangerously thin citizens. I think something similar to Spice and Wolf could have also worked, since it would be slower paced, and the elements of business, economics, and diplomacy could have been included to show how Kaito slowly built his pizza parlor empire to truly become the High-Calorie Hero of the Kingdom of Elves. All that being said, if you want to be allured by thoughts of pizza, you can order this book from available retailers found on Yen Press’ website! Special thanks to Yen Press for giving us the opportunity to review this series.